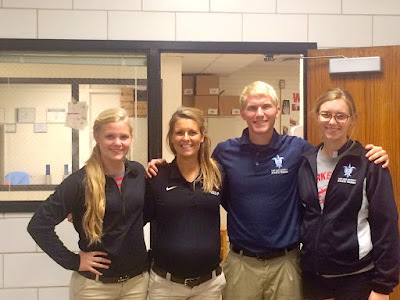 Kirkwood High School has been a great example of what working as an athletic trainer at the high school level is like. Under the guidance of our preceptor, Denise Grider ATC, we have covered a variety of sports including football, soccer, softball, field hockey, and volleyball, and also have worked with athletes from cross-country, swim, and several other sports. We have provided on-field acute wound care and aided in the on-field assessment of injured athletes. Along with providing care at games, we spend a large amount of time in the athletic training room providing protective taping and padding devices, evaluating various injuries, and leading athletes in stretches and rehabilitation activities. 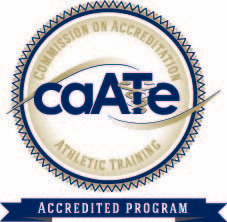 We have learned that building trust with the athletes, as well as with the coaches, athletic directors, and the many other people who make high school sports possible, is integral to helping keep athletes safe and healthy on a daily basis.